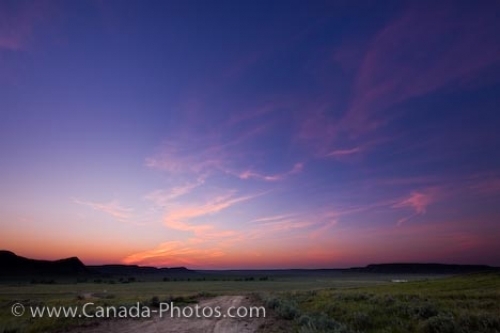 Above the acres of farmland in the Big Muddy Badlands in Southern Saskatchewan in Canada, a thin trace of pink clouds span across the sky as a dark pink, yellow and orange sunset decorate the horizon over the hillsides. Winding around the farmland, a gravel road makes its way across the Big Muddy Badlands which are located in the 35 mile long stretch of the Big Muddy Valley. The area which the Big Muddy Badlands covers is north of the boundary which divides Southern Saskatchewan, Canada from the northeastern section of Montana, USA. Saskatchewan is known for its beautiful mix of colours at sunset which enlighten the wavelike landscape of the Badlands. Picture of a breathtaking sunset over the farmland in the Big Muddy Badlands in Saskatchewan, Canada.